SAN JOSE, Calif. — Joe Thornton talked to several teams last summer when he made his first trip to the free-agent market before ultimately deciding to return to San Jose on a one-year deal. "Obviously there were some teams calling, but I told my agent/brother let's keep it quiet this year, I want to go back to San Jose," Thornton said Monday. "Obviously talking to you guys at the end of the year that's no secret. I feel this team is just getting better and better. ... Our window is always open it seems in San Jose, and it's a good feeling." 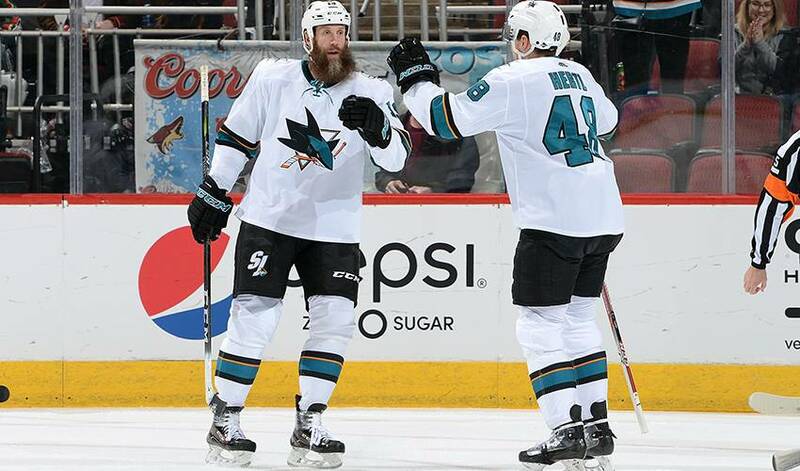 Thornton signed a one-year, $5 million contract on his 39th birthday, taking a $3 million pay cut from the previous year to help make sure the Sharks have the room to add other top players. Thornton had been willing to take even less had John Tavares decided to take San Jose's offer instead of signing a $77 million, seven-year deal with Toronto on Sunday. "It would have been nice to get Johnny, but I think if you look at our team still, Doug and Hasso and Pete, they've allowed us to compete every year, and I think there's no difference again this year," Thornton said. "We're going to compete for a Cup. But yeah, I was going to be flexible and will always try to help out the franchise in that way." Hertl took on a bigger role last season after Thornton went down with a season-ending right knee injury Jan. 23. Thornton had torn the ACL and MCL in his left knee the previous season but said he's ahead of where he was at this point last summer and expects to be 100 per cent at the start of training camp. "I've never seen anybody train like this. You look at his birth certificate and it says a number there. But he's childlike when it comes for his passion and love for the game," Wilson said. "He's had so much time now and was so close to playing that I t6hink he'll come back way ahead of where he was last year." Hertl was even better come playoff time with six goals and three assists in 10 games. He also won 57.7 per cent of his faceoffs. The Sharks are counting on more of that kind of play in the future. "I just think his best hockey is ahead of him," Wilson said. "He truly wants to be a great player. Watching him in the playoffs this year, I think everybody saw him take that step that not only we expected but he expected of himself."